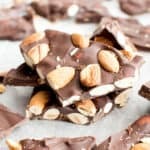 Paleo Vegan Almond Joy Truffles (V, GF): a fun recipe for homemade candy truffles that taste just like Almond Joy! Made refined-sugar free. Vegan, Gluten-Free, Paleo. First there were candy bars and now there are… TRUFFLES!! Who’s excited?!? 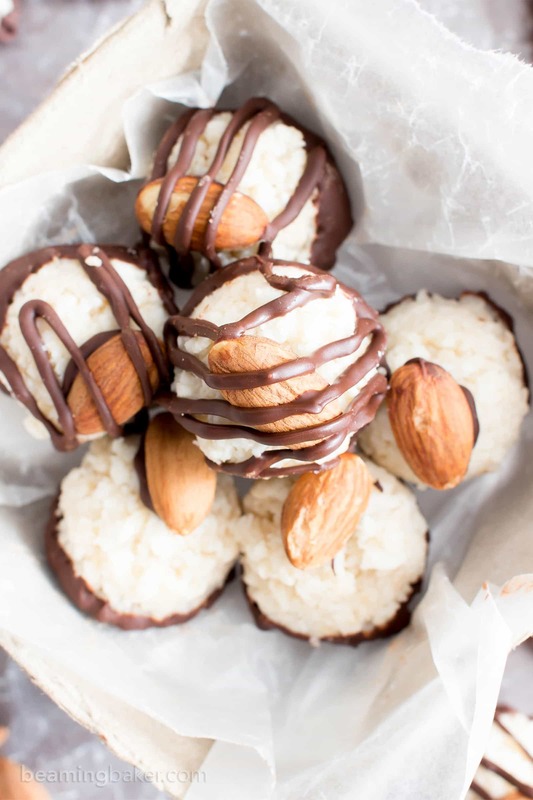 SO many of you can’t get enough of my Paleo Almond Joy, my Homemade Almond Joy Cups… my Paleo Vegan Almond Joy Ice Cream… so I thought it’d be high time to share some Almond Joy truffles. Can there truly be enough Almond Joy treats? If you said “yes,” I will see you next Monday! For everyone else, let’s gather ’round the Almond Joy fire! Alright, that sounds a tad dangerous… and yummy! Something about the holidays just begs for truffles, candy, fudge, cookies, brownies, and all the tasty things. 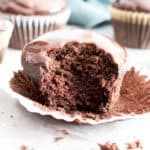 Alright, I’m gonna go ahead and shout out my newly minted (but no mint-included, to avoid any confusion) Vegan Gluten Free Chocolate Cupcakes. They’re SO good. And honestly, cupcakes need some holiday love too! Right! Holiday, candy, my mom… Well, since Thanksgiving is safely tucked behind us, and we have all the super fun gift-giving extravaganzas ahead of us, let’s get started! I can and I must live vicariously through you! As for Erik and I, we spent some super quality time with my mom, my sisters Penny, Monica, Jenny and their husbands, plus Jenny’s two little ones: Dylan and Kai. But can you believe that Kai is about to turn four-months-old already? One second, he weighed almost nothing and had the tiniest little fingers I’d ever seen (even on a Barbie!! Okay, I exaggerate). And now he’s in that super adorable chubby phase, where he’s always smiling and looking around the room. He’s even trying to communicate with us now! I mean, grunting is totally communication right? This year, we won’t be seeing two of my sisters for Christmas, so it was just so important to me that we soak in all the time we could over Thanksgiving. Anyway, enough of this wistfulness! 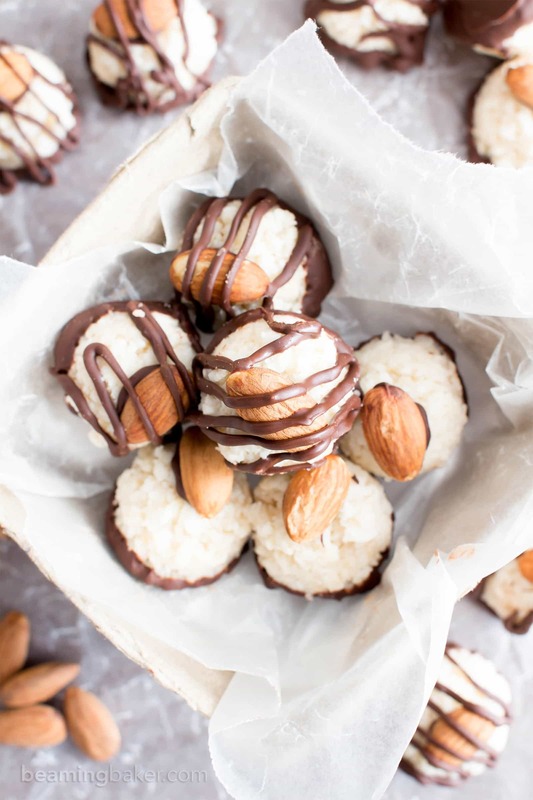 And onto these Paleo Vegan Almond Joy Truffles. I made an advanced batch for my mom and sister for Halloween and they just LOVED it. They’re lots of fun to make, and maybe even qualify as a tad bit crafts-y. The best part: DRIZZLE. 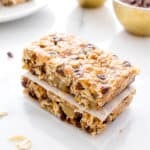 I also whipped up a few extra healthy holiday dessert recipes for everyone to share: no bake chocolate coconut bars, chocolate coconut cups, gingerbread homemade breakfast bars and ultimate peanut butter chocolate bars (yes, they are as good as they sound). 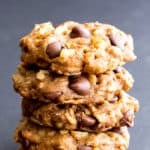 But I’m totally kicking myself for not making my pecan fudge, pumpkin chocolate chip oatmeal breakfast cookies and maple pecan brownies. Maybe for Christmas? 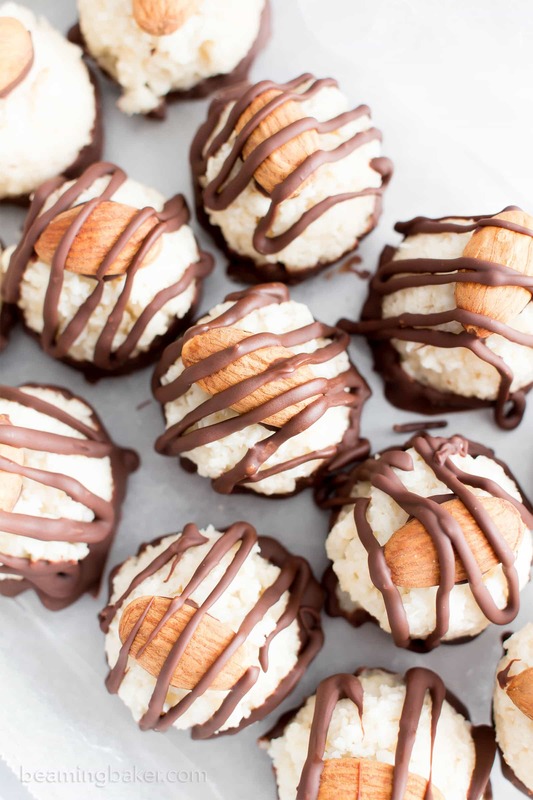 Meanwhile, I’m already thinking of all the ways to give these almond joy truffles for the holidays! They’re perfect for gift-giving, or if you’re so inclined, gift-receiving as you should totally make a batch for yourself. 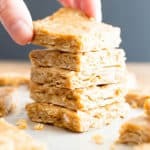 They’re awesomely shelf/room temperature stable, and also delicious straight out of the fridge or freezer (if chilled desserts float your boat). What’s your favorite truffle flavor? 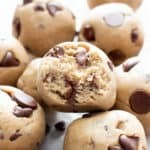 Paleo Vegan Almond Joy Truffles (V, GF): a fun recipe for homemade candy truffles that taste just like Almond Joy! Vegan, Gluten-Free, Paleo. Line a baking sheet with parchment paper or wax paper. Set aside for later. Make the Coconut Balls: Add coconut, oil and maple syrup to a blender or food processor. Blend until you get a wet and sticky mixture, with smaller, but still noticeable, coconut pieces. 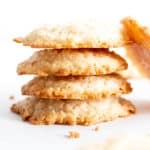 Using a 1-tablespoon cookie scoop, scoop firmly packed balls of coconut mixture. Drop onto the prepared baking sheet, making sure to space balls evenly apart. If needed, gently press and shape loose bits of mixture into a firm ball. Using a finger, gently flatten the top of a ball—this is where the almond will sit later. Repeat until no mixture remains. Freeze for 15-20 minutes. About 5 minutes before the balls are done freezing, it’s time to prepare the chocolate dip layer. Prepare the Chocolate Dip: Use the double boiler method, or the following. In a medium, microwave-safe bowl, add the Chocolate Dip Layer + Drizzle ingredients: chocolate chips and coconut oil. Heat in 20-30 second increments until just slightly softened and melted. Stir in between heating, until smooth. 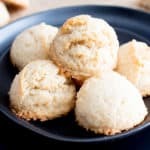 Remove coconut balls from the freezer. 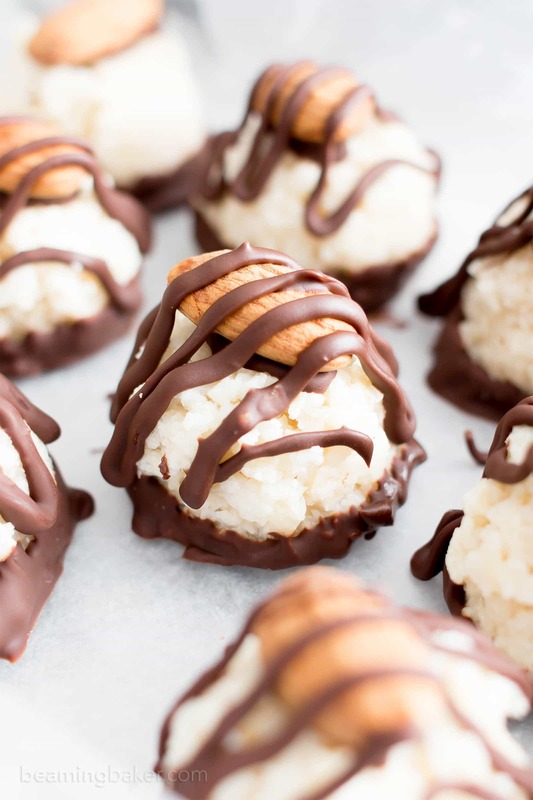 Dip the bottom of a coconut ball into the bowl of melted chocolate. Use the side of the bowl to scrape off excess chocolate—there should be enough leftover to dip almonds and drizzle truffles later. Lay back onto the baking sheet. Repeat until all coconut balls have been coated. Add the Almond Decoration: Dip one side of an almond into the remaining melted chocolate and press into the indentation on the top of a truffle. Repeat for all truffles. Using a rubber spatula, scrape remaining melted chocolate into a zip bag with a very small tip cut off, or a small drizzling bottle. 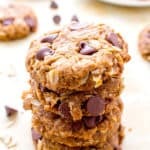 If not enough chocolate remains, mix in and melt together 1 tablespoon chocolate chips. Stir until smooth. Holding the bag over a coconut truffle, pipe the chocolate in a zigzag pattern. Repeat for all truffles. 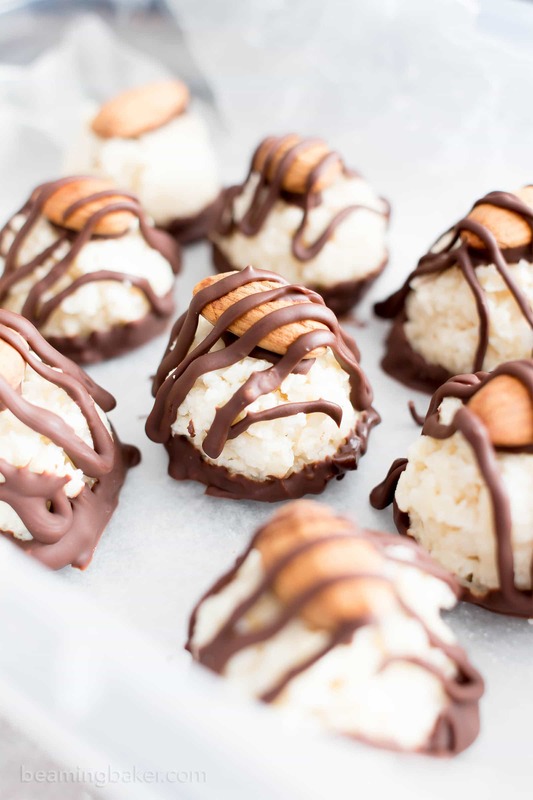 - Adapted from my Paleo Vegan Chocolate Coconut Truffles and my Paleo Almond Joy. - Store in an airtight container for 1 week at room temperature. Or, store in refrigerator for up to 2 weeks. - If freezing, store in an airtight, freezer-friendly container for up to 2 months. Allow to thaw for 10-15 minutes before enjoying. 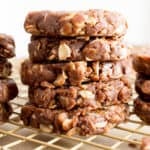 - More Paleo Vegan holiday treats recipes: paleo almond joy milkshake, peppermint fudge, no bake chocolate pecan bars. Almond Joys are my favorite candy bar! Can’t wait to add these truffles to my holiday sweet treat list! Will these droop if kept in warm weather (outside at a party) because of the high amount of coconut oil or do they become relatively solid? If so, what if I baked them for about 6 min at 325; do you think that would help the interiors set? Hi Alisha, after the first day, they’re much more firm. As long as the weather isn’t too hot, they should be fine. Also try freezing them first before the party to help them last. 😉 I don’t think baking them would work, however I haven’t tried! 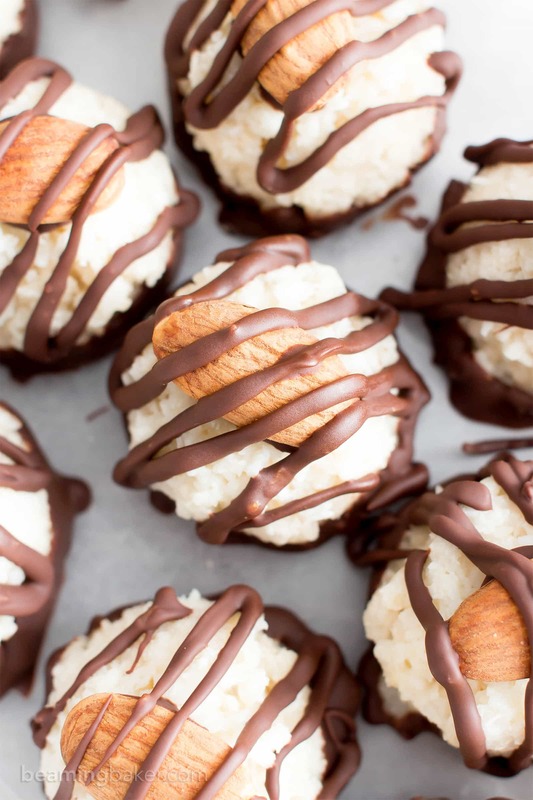 How about these chocolate dipped macaroons instead? 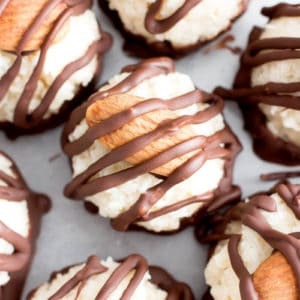 https://beamingbaker.com/chocolate-dipped-vegan-coconut-macaroons-recipe-paleo-gluten-free-dairy-free/ Enjoy! I’ve realised that you use maple syrup in almost all your dessert recipes. I really dislike maple syrup, mainly due to the amount of unnecessary sugar, or so that’s what I’ve been constantly told. If we substitute it with honey, such as Manuka honey, how would that affect the taste? What would we need to adjust to obtain a similar consistency and taste? Would we need to decrease other ingredients? 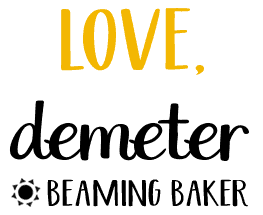 Lastly, does this apply to all recipes, such as peanut butter cakes and cookies? Thank you! Hi Ahmet! I think the honey should work fairly well in most recipes as a substitute. You may have to adjust for specific recipes, but try a 1:1 swap to begin with. Enjoy!